English: Participation of child soldiers on Iranian front (top left); Iranian soldier wearing a gas mask (top right); Port quarter view of USS Stark listing to port after being mistakenly struck by an Iraqi warplane (middle left); Pro-Iraq PMOI forces killed in Operation Mersad (middle right); Iraqi prisoners of war after the re-capture of Khorramshahr by Iranians (below left); ZU-23-2 being used by the Iranian Army (below right). 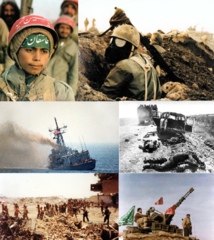 当前 2017年5月29日 (一) 08:06 572 × 642（848 KB） Greyshark09 2 images changed, the first due to irrelevance to the Iran-Iraq War (child soldier photo) and the other to illustrate the chemical warfare - a crucial element in the war. 2016年9月24日 (六) 20:26 572 × 642（657 KB） Hohum Colour correct element.